Talk about a relaxation buzz-kill. There you are, happily sprawled in your hammock, only to suddenly realize you can't now reach the refreshing beverage you left waiting on the ground. Doh. What you desperately need is a compact, stable side-table within easy reach, to hold a drink or two. Because getting out of your hammock should only ever be a last resort. 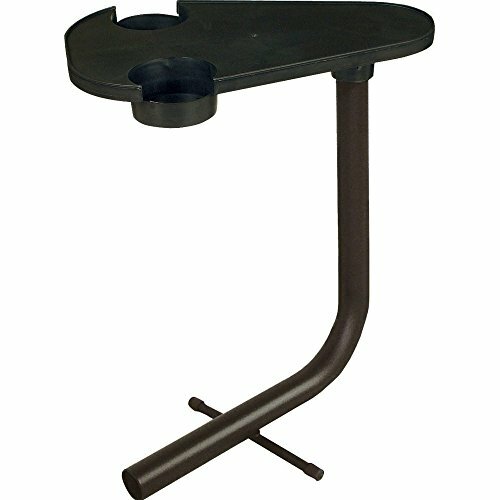 Made specifically to go with our steel hammock stands, this smart little hammock side-table installs with ease into any of the legs of an Original Pawley's Island steel hammock stand, allowing convenient access to liquid refreshment; the hard-plastic top includes two drink holders. The table base is constructed of heavy steel and finished with an attractive black Cape Shield Powder Coat, to prevent rust and other damage from the elements. The tabletop swivels, so you can pull it closer to you whenever that inevitable beverage need strikes. If you have any questions about this product by Pawley's Island, contact us by completing and submitting the form below. If you are looking for a specif part number, please include it with your message. Byer of Maine SmartRope Hammock Hanging System, 7/16” Snap Hook, 133”L, Supports up to 400lbs.